CombiForm is a simple system with many advantages compared with traditional methods of concreting floors. These items are generally available for next day delivery if ordered before 1pm. The CombiForm screed rail is made of metal with a plastic strip on the top. Easy to use, CombiForm has a weight of just 1.5kg per metre for the 105mm rail, which makes handling far more managable than the traditional concrete rails. CombiForm can be used to produce Super flat floors and its design boasts superior strength allowing it to be used with all types of vibration bridges where other similar products would simply buckle under the weight. 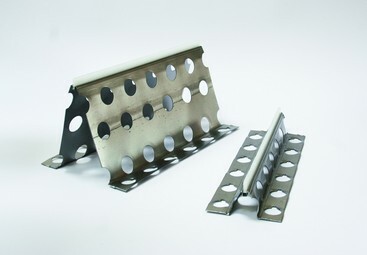 The plastic top strip is removable, this allows more flexibility as it can be left in the concrete or stripped off and replaced by different joint material. A Top Extender can be purchased which will further increase the cover and act as a saw cut. CombiForm is easy to adjust to the correct level using the adjusting screws directly on the ground or by using a ground plate fixed under the screws in softer surface situations. CombiForm can also be placed on concrete markers. The concrete efficiently penetrates through CombiForm as it is provided with rows of 25mm diameter holes, which also allows reinforcement to pass through. All existing dimensions of reinforcement bars can be used. CombiForm is easy to cut in different lengths with an angle cutting machine. The low weight of the screed rail and the advantages provided by the plastic strip and screw system reduce the risk of straining, falling and other injuries. CombiForm is delivered in lengths of 2.2 metre, 10 rails/bundle. They can be stacked, thereby taking up less space on site. You save on setting up, you can pour concrete continuously, no breaking forms, no saw cutting needed and the floor is level! · CombiForm can be assembled immediately prior to concreting. · CombiForm is suitable for all beddings. · CombiForm results in more accurate calculations. · CombiForm provides stronger floor joints. · CombiForm means less additional work. · CombiForm saves labour costs. · CombiForm reduces the risk of industrial injuries. · CombiForm provides lower production costs. · CombiForm allows continuous pouring. · CombiForm provides level floors. · CombiForm minimizes maintenance costs.